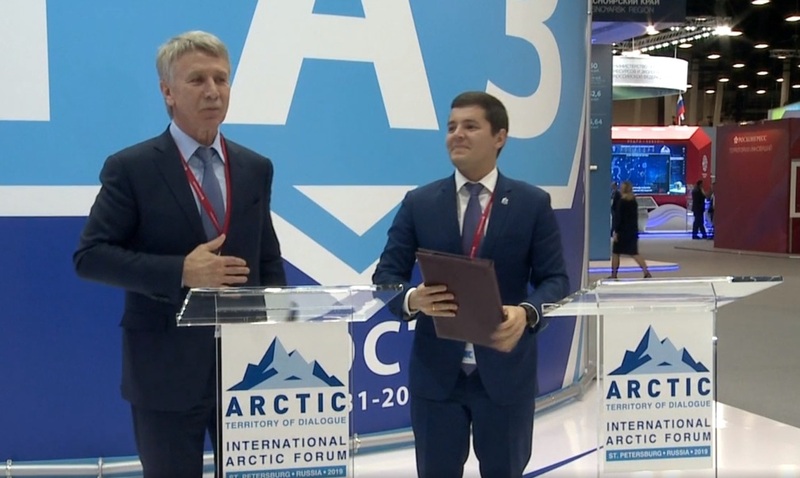 One more additional agreement to the main agreement on cooperation between NOVATEK and the government of the Yamal-Nenets Autonomous Okrug was signed at the international forum “Arctic-Territory of Dialogue”. The document was signed by the governor of Yamal-Nenets Autonomous Okrug Dmitry Artyukhov and the chairman of the board of “NOVATEK” Leonid Mikhelson. The head of the region notes that the traditional agreement is the confidence that the company will continue conducting socially responsible policy in Yamal-Nenets Autonomous Okrug. Dmitry Artyukhov notes that during the latest years the company made a big production breakthrough – ahead of the pace it launched “Yamal LNG”. And it has even more ambitious projects ahead. “There are people behind millions of cubic meters of gas produced, and it is very pleasant to realize that from year to year NOVATEK is the most socially responsible company. We have good traditions in various areas of our cooperation. This includes support for children’s sports and assistance to indigenous peoples of the North. This is help in difficult situations for different people. And all this together means comfortable life for people of Yamal living in the North. The agreement is a guarantee that the company is always there, and in difficult times we have a reliable shoulder”, Dmitry Artyukhov said. Leonid Mikhelson called Yamal the homeland of NOVATEK and remembered the years, when production in Yamal had been just begun. He marked the constructive approach of both the former and the current heads of the region to joint work. “This year is the company’s 25th anniversary. And whole its life, its development was connected with the region. We were helped to our feet. And the agreement became the tradition. Separately I would like to note that there is no such coordinated work as in Yamal-Nenets Autonomous Okrug in any other region of our presence”, Leonid Michelson said. It should be noted that several large and unusual projects were fulfilled in Yamal with financial support of NOVATEK. Dmitry Artyukhov also told about them in his speeches at the sessions of the forum. For example, last year NOVATEK built a modern, comfortable school in the northernmost settlement Gyda, Tazovskiy district. The settlement Seyakha was changed beyond recognition – the previously abandoned small settlement is turning into the modern village, which is compared with ones in Europe. Construction of the fish-farming plant on the Sob River was completed, and millions of valuable fish fry were released into rivers of Yamal.